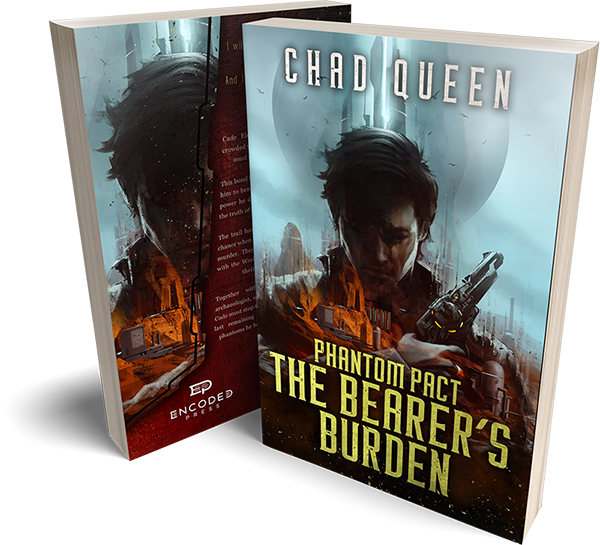 Exactly 5 years, 7 months, and 22 days ago I wrote my first notes for what would become Phantom Pact: The Bearer’s Burden. I had no clue how to even start writing a story. I had not taken a class, read any books, or even written so much as a short story since my grade school days. I only knew that I had to do something with the idea. You know the type I’m talking about–the kind of idea which, incredibly, does not capsize on endless ocean of thoughts. The idea was there to stay. Talking about doing it had been the easy part. As a new father of the sweetest baby boy, I remember rocking him to sleep at 3 AM after another feeding, trying to think of new ideas for the characters and the world of Chalice. Setting him gently into the crib and hoping not to wake him, I would tiptoe over to my notebook and write a few disjointed thoughts down, hoping I could assemble them into some coherence in the morning. And so it went. I found that I could think about the story while doing chores around the house. If an idea struck me as not particularly terrible, I’d rush to my computer to capture it before my mind could forget all the details. And when my son went down for a nap, it was writing time! And during the week, I would come home from work, put the kids to sleep, and try to write just a bit more before my eyes went on strike. After I finished the first draft, I thought I was done. I had only set out to complete the story, I had no designs of anything more than that. I had planned to run it through the spell-checker, maybe share it with some friends and family, and be done. The funny thing was that I had fallen in love with what I had written, and another idea began to take shape: what if I tried to make it as good as I could make it? What if I actually published it? The bad news was that the manuscript was trash. The world and characters weren’t bad, but the story structure needed a lot of work, and there was far too much exposition. The fits-and-starts ‘method’ I had used to complete the manuscript had left the book a patchwork of interesting concepts, but it was nowhere near publishable. As I continued to improve the book, I found it takes so much more than one person to write a book. My book would never have fully come to life without the help of my editors Andy Meisenheimer and Erin Young. I would have never had enough time to do everything if it weren’t for my supportive wife who bought me all the time she could, and my mother who did more than her fair share of babysitting. I could go on for pages about everyone that helped me. They know who they are and they have my most heartfelt appreciation. There are so many things I wish I could have told myself to do (or not do) back when I started over five years ago. But despite the litany of mistakes I made on the journey, I am happy to now be able to say it is done. I have two more books planned to round out the trilogy, and the next books will come much faster now that I understand the process. I know all this sounds a bit dramatic, especially given how many books are published every day. And I know the chance of more than just family and friends reading the book is small. But that’s okay, because I got my chance to finally make the story real.